According to the NAICS, reporting from US Census and Bureau of Labor Statistics data (I believe), there are 39,575 companies in the US that classify themselves in 541511. BizMiner reports a total of 46,428 companies in SIC 7371. My order-of-magnitude estimate about how many people are involved in building and running such companies is therefore 100,000. Of the 24,413 firms in the data above (this number differs from 46,428 because of how companies classify themselves, and the hierarchical nature of the classification scheme), the average revenue is $2,200,000. The gross revenue of all companies (calculated by multiplying the average revenue for each class by the count in that class) is $55.8 billion. That’s a drop in the bucket for the US GDP of $14 trillion, but not exactly an inconsequential number. And of course, if the fees paid to these companies are well-spent, then the total economic impact of what they produce is substantially larger. It’s pretty clear from eye-balling the data above that there are a whole lot of small companies in our segment and relatively few large ones. 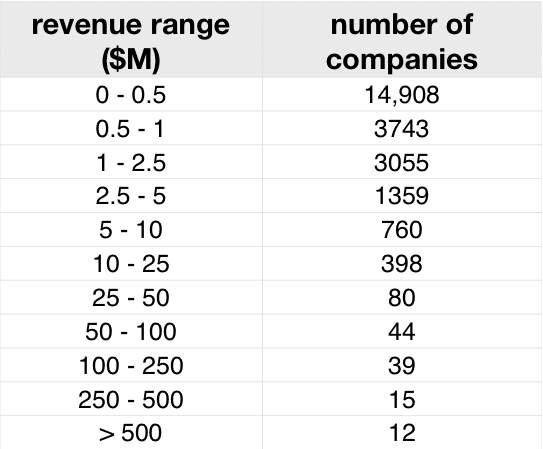 If you arranged buckets for different revenue ranges, and then you put each company in their respective bucket, how big would each bucket need to be? In other words, what’s the distribution of company size? When I played with the data, I came to the conclusion that company size follows a power law distribution. You can figure this out by plotting the count of companies in each bucket versus the average revenue for that bucket on a log-log graph, as below. The resulting straight line shows the power law relationship. 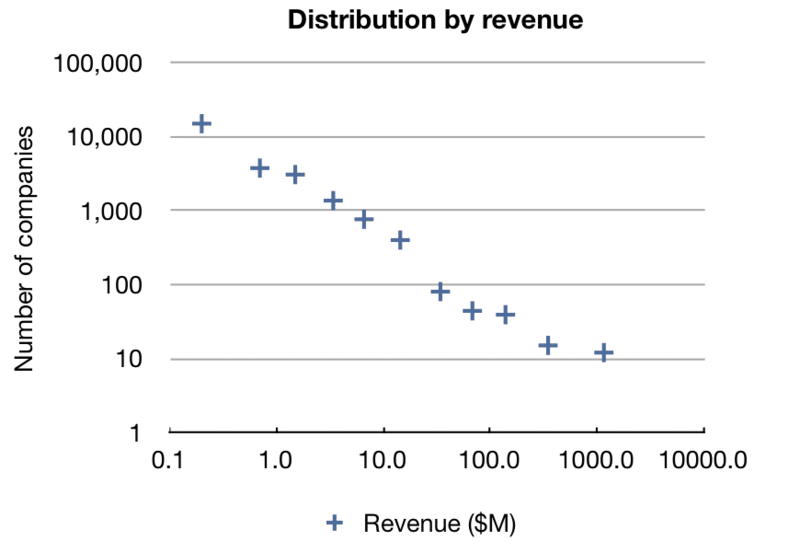 Company size by revenue on log-log plot shows power law distribution. Another term you may have heard for power law is the Pareto distribution. When people say something follows the “80-20 rule” this is what they mean. The classical example of a Pareto distribution is wealth: 80% of a society’s wealth is held by 20% of its population. Other natural phenomenon that follow a power law distribution include the population of human settlements, the size of meteorites and sand grains, and the size of files transmitted by TCP. In the case of our industry, it’s actually closer to 85/15, as in 85% of the revenue is generated by 15% of the companies. For the purposes of Great Not Big, the inverse view is more interesting to me: 85% of our companies have revenues of $1.2M or less. Great graphs, thanks. 85% of the wages in the US are less than $1.2M as well, so this doesn’t surprise me, but it’s cool to see it applied to custom software developers specifically. I’m surprised it’s that high considering how flat the software world has become with cheaper, smarter, more productive foreign labor. I have some more data I’m working with that shows the tiny company end of the spectrum has seen more growth in the last five years than the larger companies. I’ll write on that at some point. A friend pointed me to Manta after I wrote this post. The revenue data they have matches with what I found on BizMiner. I also feel that we are in the beginning stages of Alvin Tofflers “Third wave”. We went from Agrarian to Industrial and are now in the beginning stages of the knowledge wave. We are the engineers that are building the tools and machines of the knowledge era. It is the software industry that is driving this new phenomena where we are harvesting and encapsulating the knowledge to wider audiences. In terms of the business models, the most successful companies in our industry are the ones that not only use the tools and techniques to build knowledge but also take ownership and know how to package that knowledge for business advantage. This discrepancy may explain why some software companies are financially successful while others survive but don’t thrive. Good point, Gert. Cool technology by itself is just that. To what end do we build? What’s it doing for users? for our customers? That’s a level up the stack, so to speak.